Surrendered by some Arlington teenagers, Black Cat came with a severely infected and damaged shoulder. 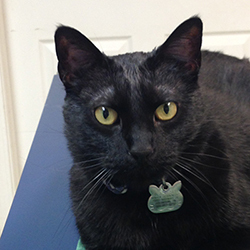 Dr. Schoknecht and her staff nursed Black Cat back to health after months of care and surgery to repair his shoulder. You can still see his surgery scars today! He is a client favorite, always enjoying being with the patients and clients. His joys in life are treats and raising orphaned kittens. Copyright 2015 Arlington Animal Clinic. All Rights Reserved.